On the 14th June, 19 members visited the Oxford Botanic Garden for a guided tour. We were fortunate in having a beautiful sunny afternoon, and for our benefit our two guides concentrated largely on the history of the garden . The land had been a Jewish burial ground until the Jews were expelled in 1290, and later Church hospital burials took place on the site. The Garden itself was first endowed for the sum of £5000 by the 1st Earl of Danby in 1621, and 5 acres of land were enclosed by stone walls. These were double skinned, the centre being filled with rubble. They also extend as far below ground level as above. This was to be a physic garden for medicinal plants to support the University’s teaching, and only gardeners, dons and students were allowed access. The general public were not allowed in until 1880, and then only men were allowed for a very limited time with close supervision. are thought to have come from the tomb of St Frideswide, and to have supported cages holding monkeys in the 19th C.
The second phase of the garden’s development extended beyond the walled garden to the south, and was bordered by the Cherwell. The land here had to be raised considerably to prevent flooding. This is evident when you look over to the level of the playing fields on the other side of the river. border along the south-facing wall. 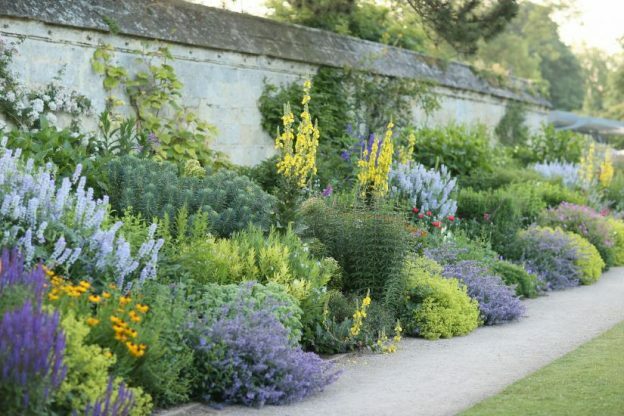 The garden has also been used to supply much-needed food at least twice in its history, firstly during the siege of Oxford in the Civil War, and then in the ‘Dig for Victory’ movement in the Second World War. The garden also followed popular fashion in the plants grown, particularly the pineapple which needed specially constructed beds consisting of a pit with a base of pebbles, then manure and tanning waste. The fruit could be hired out for a guinea a night if returned undamaged, otherwise they cost two guineas. The garden also followed Chatsworth in building a pond to house the Amazon Lily. We were able to visit the pond in one of the glasshouses. The garden itself was founded in 1632. It was the first of its kind in England. The first Superintendent was a German named Jakob Bobart, who was appointed by Henry Danvers, First Earl of Danby. He had the right to sell fruit and vegetables from the Garden, which was necessary as his pay was £40 per annum, from which he was required to stock the Garden. In 1648 Bobart published a Catalogue in alphabetical order of 1600 plants in his care. plants’ fruits for classification. He was also the first person to write on a specific group of plants – the Umbelliferae. The Sherardian Chair of Botany was established in 1734 following an endowment by William Sherard. He stipulated in his Will that the first holder of the Chair should be Johann Dillenius. After his death his collection of manuscripts and books, and dried plants came into the possession of Oxford University. Dillenius was followed by Humphry Sibthorp, and later his son John, who took part in the foundation of the Linnean Society in 1788. In 1794 he published ‘“Flora Oxoniensis” and founded Oxford’s Sibthorpian Professorship of Rural Economy. The last significant name to be mentioned on our tour was that of Charles Daubeny. He conducted experiments on the effects of soil, light and the composition of the atmosphere on vegetation. He was also a good fundraiser and engaged well with the public. During the course of the afternoon we learned a great deal about the Garden, not least that the oldest plant still existing – a yew tree – is the last survivor of the original planting. This entry was posted in General interest, Talks on June 26, 2017 by Bob Goodenough.